A new study suggests that our aging immune system plays a larger role in cancer than previously thought, challenging the conventional notion that genetic mutations are the primary driver of tumors. The research suggests that the key to cancer prevention and treatment may lie in bolstering the immune system, using techniques such as restoring thymus function, rather than addressing genetic mutations. The genetic mutations that occur as the result of DNA damage are the current focus of most anti-cancer efforts throughout the world. These new findings could have significant implications for the fight against cancer if borne out by additional studies. The chance of developing a tumor rises dramatically with age. Cancer is one of the top two leading causes of death, and 8 million people die of cancer worldwide each year. The traditional view is that cancer is caused mainly by genetic mutations. The mutations arise either as a result of genetic makeup or due to lifestyle and environmental factors, such as toxic pollution and cigarette smoking. The prevailing belief is that cancer increases with age due to multiple mutations in a single cell, where five to six mutations are typically required to initiate cancer. The team announcing the finding includes researchers from the University of Dundee, the Institut Curie in France, Heriot-Watt University, and the University of Edinburgh. The international team found that, when compared against genetic mutations, the age-related decline in our immune system may play a stronger role in the increasing incidence of cancer. “Nearly all of the mainstream research into cancer is based on how we can understand genetic mutations, target them and thereby cure the disease. We’re not debating the fact that mutations cause cancer, but are asking whether mutations alone can account for the rapid rise in cancer incidence with age when ageing causes other profound changes in the body.” Adds Dr. Newman. Following a hunch that an aging immune system may result in higher rates of cancer, the team examined data on 2 million cases of the disease. The international team then developed a mathematical model that mapped increases in cancer in relation to the declining immune system. The researchers then compared their model against age profiles for 100 different types of cancer. Their new model fitted the data better than the ‘multiple mutation’ hypothesis. Because the immune system declines more slowly in women than men, the researchers were also able to account for the gender difference in rates of cancer. Men are far more likely to get cancer than women, a phenomenon that cannot be easily explained by genetic mutations. The researcher’s findings suggest that our declining immune system plays a much more significant role in the development of cancer than previously thought. If borne out by further studies, this result could have significant implications for cancer prevention and treatment worldwide. A primary cause of immune system aging is a shrinking and increasingly dysfunctional thymus gland. The thymus produces T cells, the foot soldiers of the immune system that circle the body, hunting down and killing cancer cells and pathogens. Moreover, researchers suspect that an aging immune system leads to chronic low-grade inflammation, referred to as inflammaging. The new study shows that our immune system doesn’t just protect us against germs and viruses, but also plays a role in detecting and killing cancer cells before they have a chance to get out of hand. The thymus becomes mostly inactive during adulthood, a normal process of aging called thymic involution. Our thymus begins to shrink around the age of one and roughly halves in size every 16 years, leading to a corresponding fall in the production of T cells. 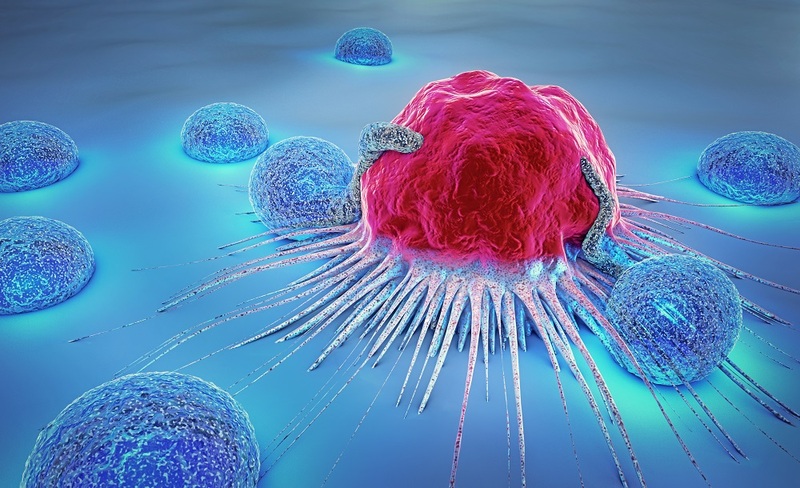 The team of researchers at Dundee found a robust correlation between the rate of cancer and the fall in the creation of new T cells. “The increase of cancer incidence with age is slower in women, something which we would naively expect to be effectively gender-neutral. However, the thymus gland shrinks [involutes] more slowly in women, so we were able to make a prediction on the differential cancer incidence with gender that once again shows our model to be more accurate than the traditional model.” Said Dr. Luca Albergante, who was formerly with the University of Dundee and is now based at the Institut Curie. Dr. Blackburn suggests that the key to cancer prevention may lie in boosting thymus function. A team led by Dr. Greg Fahy suggest that restoring thymus function may be done safely and effectively, by regrowing the shrinking thymus. Because of its central role in our immune systems, some longevity scientists regard restoring thymus function as the ‘holy grail’ of preventing age-related immune decline. In fact, rejuvenating the thymus is such as prize that several organizations have been competing to be the first to do it. The organizations in a race to be the first to rejuvenate the thymus include the National Institutes of Health (NIH), Aubrey de Grey’s SENS Research Foundation, and ThymiStem. Dr. Greg Fahy reports using human growth hormone (HGH) and DHEA to regrow the thymus. Dr. Fahy uses DHEA to head off potential side effects such as tumors and declining insulin function that are typically associated with HGH use. As a related article shows, the successful preliminary results of a clinical trial led by Dr. Fahy suggest that it may be possible to regrow the thymus to boost our flagging immune systems. Related: Restoring thymus function shows promising early results in a clinical trial. Cover photo credit: Man_at_Mouse. Getty Images. “Aging immune system may explain age-related cancer risk increase.” University of Dundee. February 5, 2018. Link to press release. Sam Palmer et al., “Thymic involution and rising disease incidence with age,” PNAS (2018).